Back in 2007, astronomers detected an incredibly brief, incredibly strong radio wave burst in Australia. And now, on the opposite side of the world, astronomers have detected a second blast of similar proportions. Meaning that A) the first one wasn't a fluke, and B) we have absolutely no idea what's causing them. 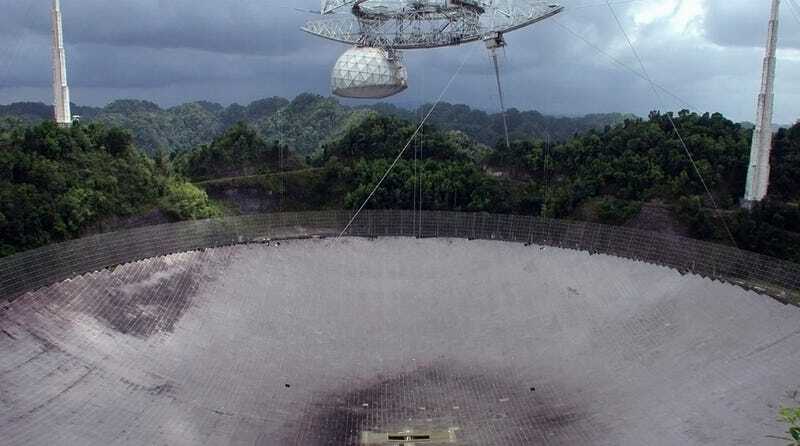 This second ultrafast flash of radio waves was discovered by the Arecibo radio telescope in Puerto Rico, which had been putting out its feelers in hopes of discovering neutron stars. Instead, it got the second instance of so-called fast radio bursts (FRBs), which finally allowed astronomers to rule out cosmic noise and formally report them. Because unlike the radio signals we usually detect, these radio waves "show every sign of having come from far outside our galaxy." We really have no handle on what they are. Scientists are highly skeptical of such discoveries … [that] all of the bursts up until now had been discovered by the Parkes telescope was a cause of concern. Now, with the discovery of a burst from Arecibo, we are more confident that FRBs are astrophysical phenomena, and discovering and classifying them should be a priority of radio astronomical observatories in the future. There's even been discussions in the literature about signatures from extraterrestrial civilizations. It may be quite a while before we get any definitive answers, though. The two radio telescopes that detected the waves suffer from tunnel vision, which means that since our view is so limited, any FRBs we find in the future will largely be thanks to luck. But as Cornell astronomer James Cordes also said to NPR, "The nice things about this in the current stage is that we really don't know what these bursts are caused by. And so the sky's the limit in some respects."